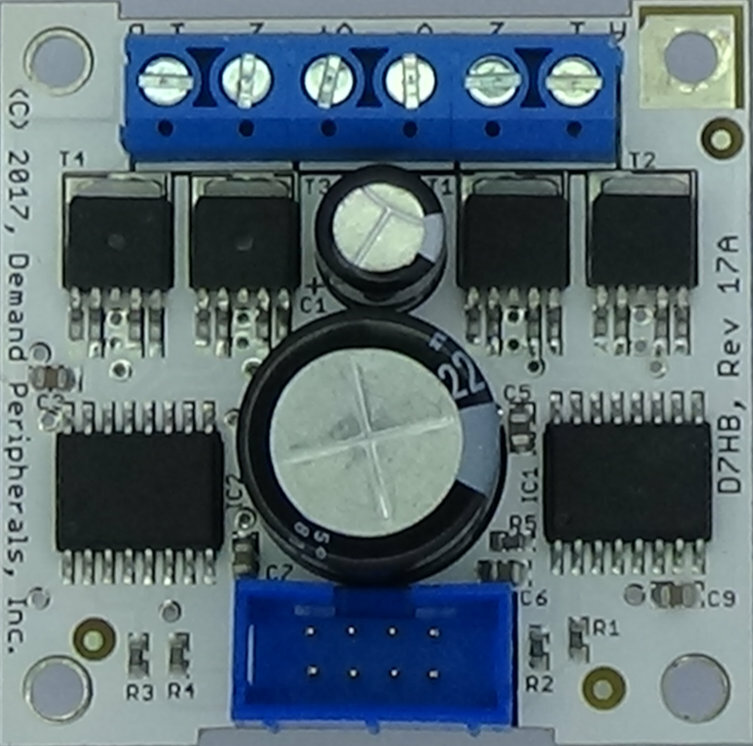 The DC2 peripheral controls the speed and direction of two brushed DC motors using the D7HB H-Bridge card. The motor speed signals are pulse width modulated (PWM) signals with a programmable PWM frequency and a duty cycle between 0 and 100 percent. Resources let you control each motor as well as set the PWM frequency. A watchdog timer can shutdown both motors if the host stops writing to the peripheral. mode0, mode1 : mode of operation for the motor. power0, power1 : PWM 'ON' time as a percentage. The speed resolution is 10 bits for PWM frequencies below 20 KHz. The speed resolution is 8 bits for a PWM frequency of 78 KHz. Reading this give the _current_ speed. Writing it sets the _target_ speed. Current speed is subject to the constraints of slow start and slow stop so the current speed and the target speed might not be the same. That is, when you read the speed you might not immediately get back what you wrote to it. pwmfrequency : PWM frequency in Hertz. The driver tries to assign a frequency as close as possible to the one specified. For example, a requested frequency of 12510 Hertz might result in an actual PWM frequency of 12500 Hertz. The PWM frequency is the same for both motors. The default PWM frequency is 20000 Hertz. The default value for slow_start is off to full power in zero milliseconds. That is, the default is to turn off slow start. slow_stop0, slow_stop1 : Deceleration curve. The default value for slow_stop is full on to full off in zero milliseconds. That is, the default is to turn off slow stop. watchdog : Timeout in milliseconds. As a safety feature, the FPGA hardware can turn both motors off if there is no speed or mode update within the specified time. The time is specified in milliseconds and has a maximum value of 1500 milliseconds. The resolution of the watchdog timer is 100 milliseconds, and a value of zero turns off the timer. The default value is 300 milliseconds. Set the PWM frequency to 20KHz, put both motors into forward mode, set the watchdog timer to 500 ms, and set the PWM percentage to both motors to 65 percent.